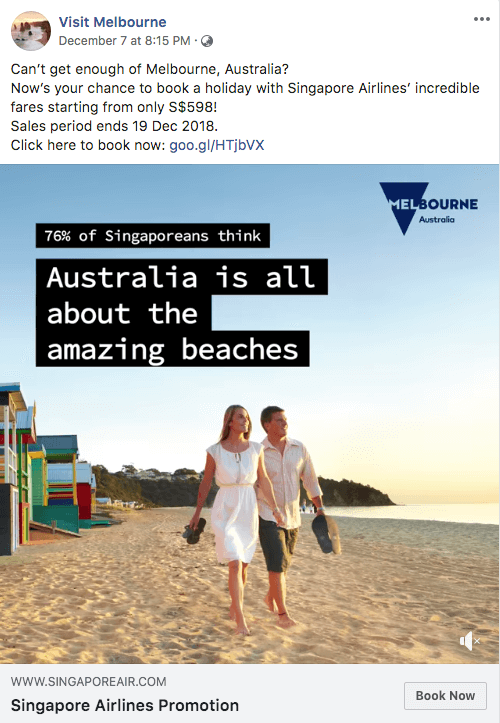 8 Facebook Engagement Tactics that work for brands in Singapore. Hi! Leave your contact details here and we'll reply in a jiffy! 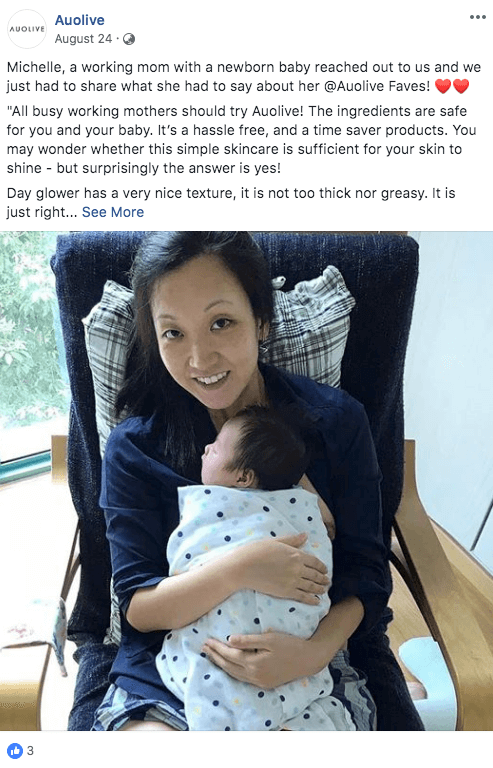 Facebook is a marketing channel that cannot be ignored in Singapore. According to statista.com, monthly active Facebook users are expected to rise to 3.26 million by 2019. So while Instagram and other marketing portals are rising in popularity, it remains a marketing channel that cannot be ignored. Many brands in Singapore are realising that their internal marketing team may not be equipped or overwhelmed by daily works to focus well on this important sector. Discover what Social Media Marketing means to your business and how it can actually generate traffic and helps you in your sale cycle conversion inevitably. 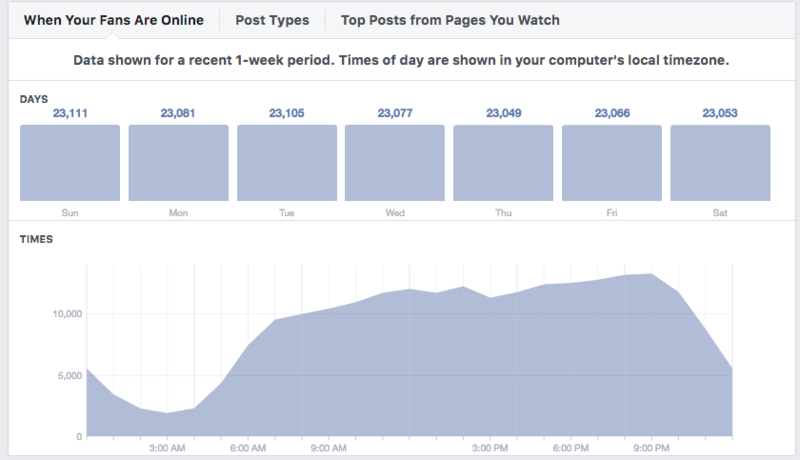 So why is engagement such an important factor in Facebook again? Attracting engagement is not only for the emotional involvement between brand and Facebook users. In 2018, Facebook has declared news feed algorithm is central to the visibility of your posts to and from friends and family. 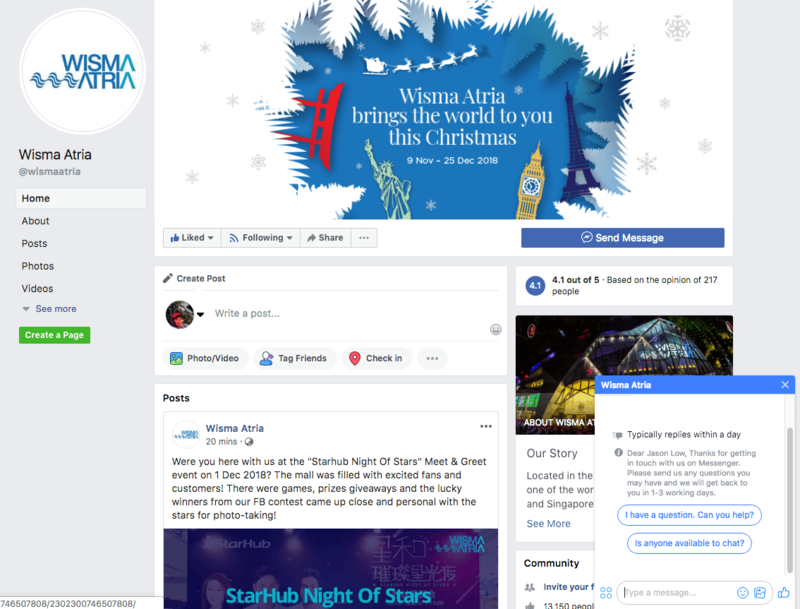 To discourage business broadcast of "news and promotions" and be even visible of newsfeed, it is important marketers start to create posts that can attract long comments and meaningful sharing and discussion. Thus the key of successful Facebook marketing is your engagement tactics. You might say "That's easy. Just create a "like and share" contest lor…Give some prize and sure have lots of activities". Note that Facebook continues to demote posts and brand page that uses engagement bait to beat algorithm. Let's not be too serious. Firstly, understand what works and not for your Facebook marketing. If you are holding a dinner party in your house for your husband’s buddies and friends. The key to making it a success is to understand the type of food, table setting, drinks menu and even the conversation perhaps. Similarly to Facebook marketing, you would need to know what are the markers that help you find success. Lets' start off with a simple list to get you started if you haven’t done your Facebook marketing this way. Knowing when your audience is there. Look around us in Singapore and make a guess when we are most active on Facebook? Our social media marketing services to our clients allow us to take a general swipe at this question. Fans are most active during the commuting hours to work and back on weekdays. Knowing this allows you to post at the most effective time. Open your Page Insights tab. Navigate to Posts in the left navigation and check the time that your audience is most likely to be online. Use this information to your advantage when you plan your posting schedule. In this insight, 9pm - 7am is obviously not a good time to post. OCG is an abbreviation for OC Group. We live by our motto - Only Conjuring Goodness for 15 years and counting, providing our integrated marketing expertise and customised suite of digital solutions to brands in Asia Pacific. Despite the fast-changing technologies and trends, we have survived and dominated the industry because we care to move ahead of time. Our playground has no boundaries. We are a special breed of people with an aptitude and attitude to do the best, for you. No brand is too big or too small for us. You are the biggest motivation for us to run the extra mile. Rubbing it the right way with our audience. Are you the plain old jane in the party or you are the rock star of the party? You decide. All good social media agency will develop a social media editorial plan. If you are on your own, you could make your own editorial plan too. Generally, it’s quite clear that your content are categorised as Video, Photo, Links and Shared Video. While on the broad stroke, that’s a good indication on how your fans engage but you could further indicate in your own reporting the type of topic and content type that might works. Agency tip: For best result in getting a story, download your data from Facebook insights and import it into your own excel. Create segmentation based not only the final output but also on content type. For example, if you are online retail, you could tag these unto your content to see what works and not. 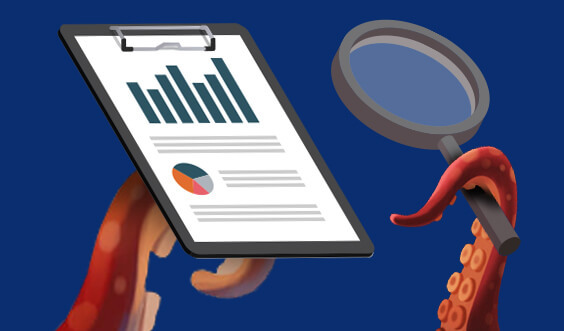 While agency probably uses lots of other paid tools for better analytics, starting this will help improve many businesses here. Even your most loyal fan will be tired of straight line content plan. Like the social butterfly you see in the party, it’s important to vary your conversation and topic so that there’s always excitement, envy and dose of unpredictability in you. If you think is too much work but find Facebook marketing just an important, we have the right social marketing service for you! The social lingo is fun. 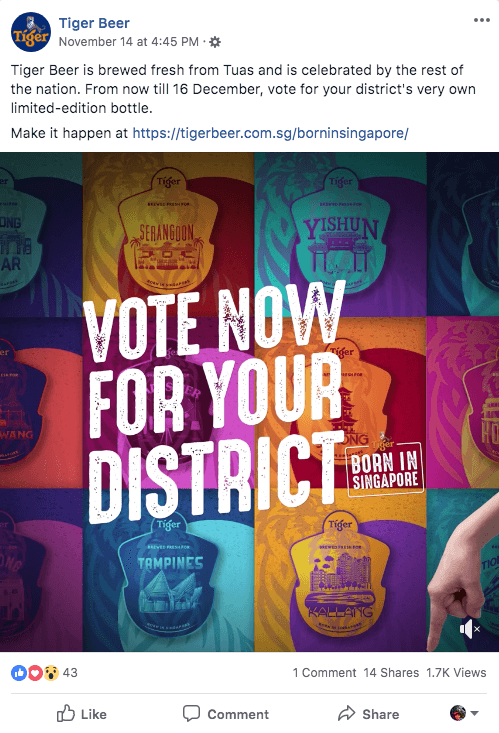 Tiger Beer is one of the most well known brand around Singapore. The brand is also game to be in trend and approach their post in light hearted manner. Creating Facebook Messenger Bot for people that has engaged with your page is gaining some level of popularity for brands to further improve their call to action rate. These bots solutions allows you to provide automatic response to comments added to a post. You can ask people to comment on your post and reward them with some freebie in their inbox if they do. This strategy is great for lead generation or when you have periodic offers. You can build a list in the messenger and later use the bot to deliver these vouchers unto the messenger inbox. Improve engagement by share of offer. Offer post like this generally attract lots of participations and comments. These comments can help signal to the Facebook algorithm that you are participating in quality content so more of your audience should see this post. It doesn’t always have to be someone famous or a celebrity. Sometimes, the truth of your products are told simply by your actual customers. Develop a close relationship with your customers offline as well. Sometimes, they are willing to show their advocacy which works brightly for your brands. While the outreach result is not going to be as effective as influencer marketing, it gives your future customers a real idea on how effective your brands is. No frills. In the eye of your customer: Product that works. Working with relevant KOLs help you reach your product beyond your own base. In the eye of your customer: Service that sells. Working with real customers can work too. Even if its exposure is not as effective as KOL, it's a good build up of your brands' strength. Being in Facebook is like being in a real community. Discussing and sharing local news and assimilating it to your brand is a great way to draw responses from everyone. Your presences of being a friend than a serious entity that is trying to sell is priceless. People generally respond much better to friends than salespeople. All brands talk about key moments that coincides in their marketing calendar. (i.e. 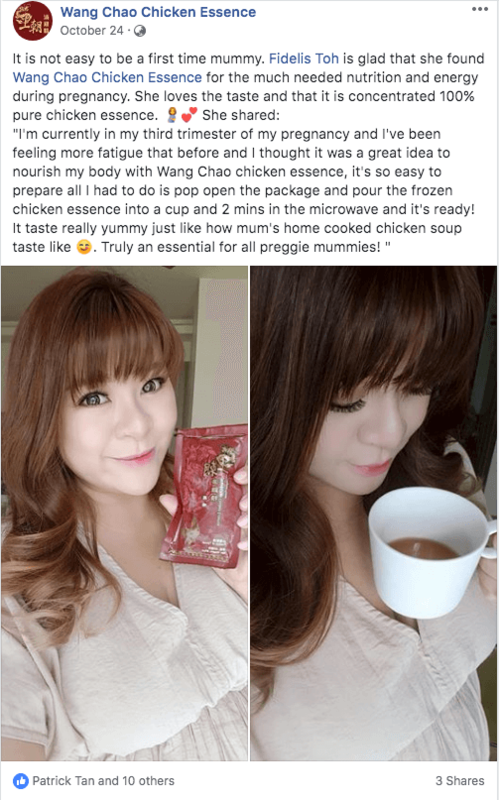 Great Singapore Sale) To really stand out, create posts that your audience cares about. One of the remarkable happenings recently in Singapore was that the eclipse. 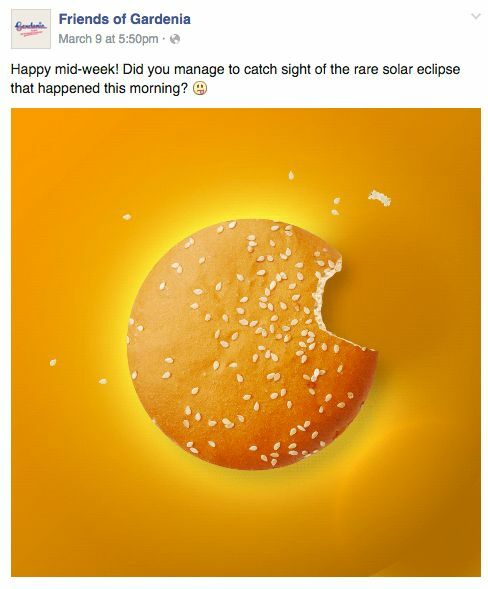 We worked with Gardenia Singapore to immediate to assimilate the full eclipse to their full moon buns. The results was amazing. Laugh with you or at you? Sometimes, it does matter. Especially if it is in the social media world. The social lingo is fun and its all right for your brand to act like a likeable human at times. 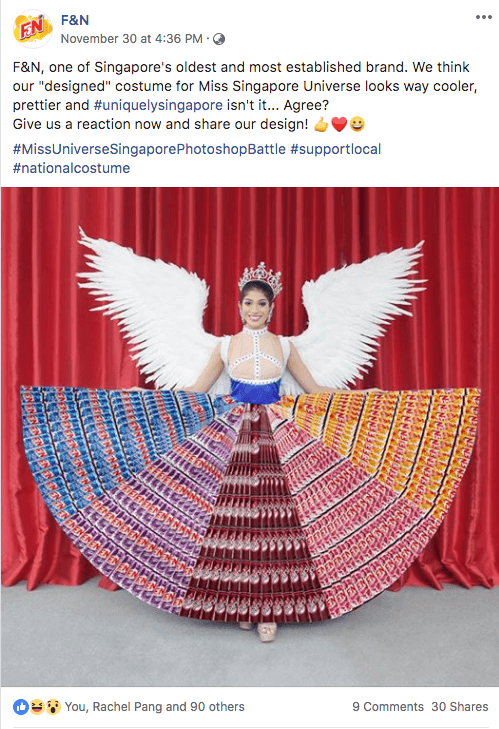 In this post, we took a poke at Singapore’s Miss Universe’s national dress in a Photoshop battle with the different F&N’s soda colours. The visual was done light heartedly, drawing innovative comments on how F&N can make use of its heritage. 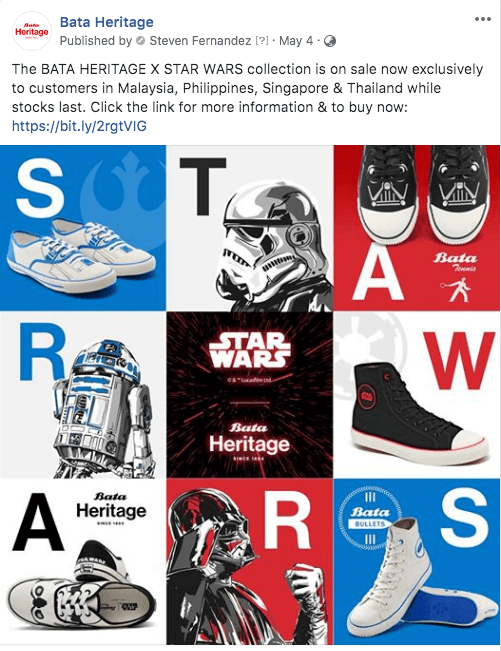 In this instance, the brand is immediately recognised as one of the oldest brands in Singapore that still in-tune with social media. You don't have to be a professional comedian. Just eyeball and be creative of what is trending around you. F&N Singapore (36,000 followers) is professionally managed by OCG Social media team. The first stage in creating engagement is to attract attention to your posts in the Facebook news feed. Using images and video that stand out without being garish and speak to your target audience is essential. Also remember that you’re not restricted to sharing just a single image or video in a Facebook post. Try adding more than one image or using a carousel format to attract more eyes to your content. Facebook states that ads using the carousel format deliver a cost per click that’s 20%-30% lower than standard link ads. There’s every chance that this uplift in effectiveness translates to organic posts too. Alternatively, consider creating animated visuals and/or creating GIFs as an eye-catching alternative to static images. There’s a whole raft of tools and apps available that make this a viable option for even the most non-techie marketer. F&N Singapore (36,000 followers), IMM Outlet Mall Singapore (67,000 followers), Visit Melbourne (981,000 followers) are professionally managed by OCG Social media team. Agency Tip #6 - Go LIVE! The fastest way to improve engagement is to go live on your page. There are many reports to suggest Facebook is encouraging this form of interaction and is probably the best way to truly reach out without having to pay an ad dollar (at least for a short while). In some reports, we have heard Facebook Live attracted over 1300% more comments and reaction than uploaded video posts. Live videos should be about 15 minutes long in nature to maximum your engagement. We have seen many Facebook LIVE that are ill prepared so make sure you don’t. If you want the extra oomph, consider giving out special incentives (i.e. Free Shipping) or share special promotion during the duration of the live broadcast. Agency Tip #7 - Response! This is basic courtesy really. The more responsive you are to people who comment on your posts, the more likely they are to continue to respond to you. Facebook algorithm counts discussion as a strong signal of quality content, so the more you respond to comments, the better the algorithm. You have worked so hard to get a reply from your customer. Now don’t lose the opportunity to connect with them. Being responsive also can help boost your profits. People are more likely to buy from brands that are responsive on social media. Our last tip is probably the most important because besides the hygiene of creating a good social media Facebook page, investing on social media cells and influencers is very important for you to maximise the reach out. It is also the last tip because it is a tip that needs some monetary investments. But if you are serious about building your brand on social media, do read on. No man is an island and it is difficult to build a base alone. Typically, lots of our clients work with influencers to raise awareness on tactical campaigns or launches. Working with the right Influencers does have impact to your marketing works. With our agency, we also work with a very specialised group of social media cells to help boost organic reaches. These social medial cells are natively very viral in their daily posts and contents. Working with them from time to time allows our brand to improve their organic reach and viral effects. Let us assist you in reinventing your content marketing wheel and play Social Media to your advantage. Click here to arrange a quick meetup with us now! We'll bring along freshly baked cookies and tea. Discover How Your Brand’s Facebook Marketing is faring against our agency’s check list. Not just an AUTOMATED Click Bait! PERSONALISED by our agency’s team of experts*. Note: The FREE Service has a component which our team manually assess your Facebook page. Due to overwhelming responses, we give priority to emails with company domains. Thank you for understanding. We respect privacy. Your information will not be shared. We have send an email for correspondence. We are a boutique digital and social marketing agency with strong business understanding & localised market knowledge. We combine our expertise in creativity, social media analytics and media content distribution to bring the best results for our brands' need. Copyright © OC GROUP All Rights Reserved.